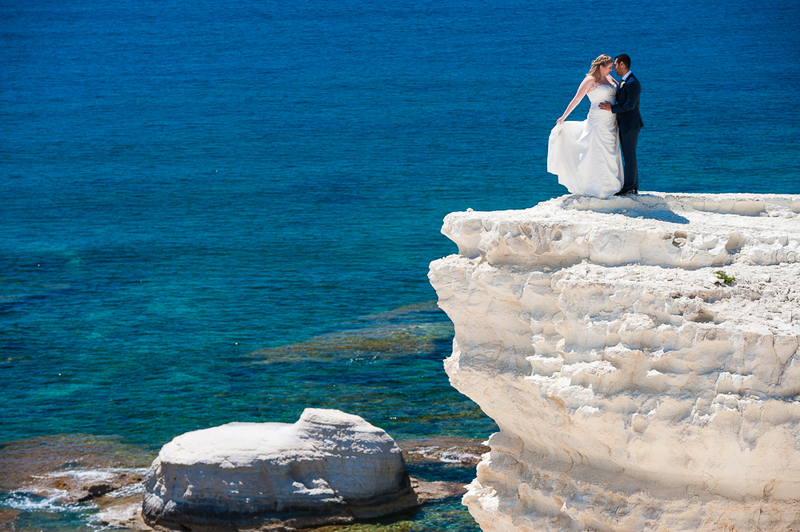 Quick wedding – 24 hours in Cyprus only. Coming from Dubai to have Stress free wedding in Cyprus. Thanks again for your help with everything – you made our day amazing – even for a fly-in wedding!! 🙂 The venue at Peyia and the Sea Caves was just out of this world. So we thank you so much for recommending this place! Even though we wished we could have stayed a few days longer, the day itself couldn’t have been better – it will be a day we will remember always! 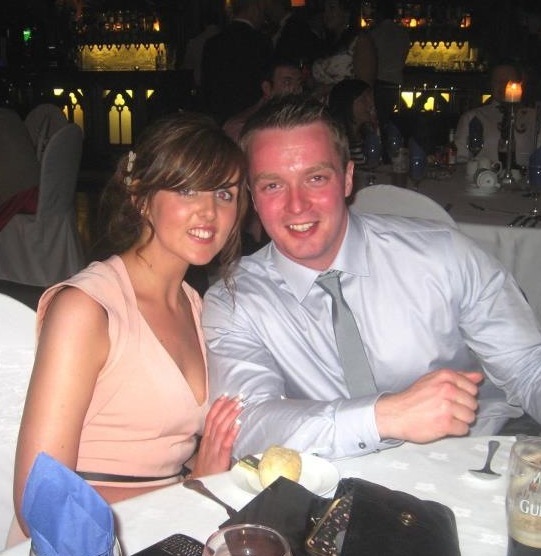 Just 74 Day’s till we Marry in Cyprus. Well 74 days to go!!!! Can’t believe how quickly time is going! Stella Virdi has been fab! Always on hand to answer questions and offer advice!! Dress is almost ready for final fitting! Bridesmaids are sorted! Suits are sorted, just counting down the days!!! I cant wait!! 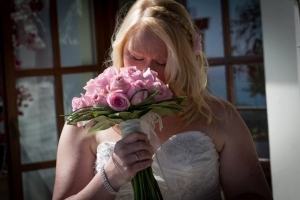 Magical, Special moment when you see your wedding flowers on your wedding day. This photos says it all. From bouquets to buttonholes , lavish table arrangements to fresh rose petal confetti, we can provide coordinated and beautiful flower arrangements to compliment the bride and enhance your wonderful Cyprus wedding venues. 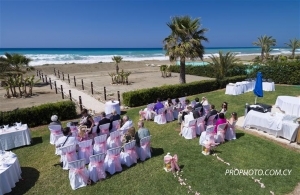 Our experienced Cyprus florist will advice and provide you with many choices of flowers and design not only for your bouquet, but for your table arrangements , ceremony & reception venue decor too. An intimate Villa wedding just for 6 of us! We had such an amazing time in Cyprus, thank you so much for organising our intimate ceremony. We are now back in the UK and it’s 8 degrees!! I want to come back already! Please pass on our huge thanks to Amanda who prepared amazing food for us and made our family feel so comfortable. Sherrie was fantastic too – I’m sure she wondered why she had to coordinate something so simple but she completely understood when I said I didn’t want the entrance and our day was perfect, just as we imagined it would be. Jim was lovely, made us feel completely at ease and I have already taken Paris’ advice and covered my bouquet in hairspray and put them in the loft. I can’t wait for 6 months time when I can take them out and use them as a centerpiece on our dining table! I love our photos I spent all last night looking through them. You have such a friendly and fantastic team. We are so grateful to you all for making our day come together as it did. Villa weddings are becoming increasingly popular – You can chose to have a low key or extravagant affair and this is the beauty of a villa wedding. 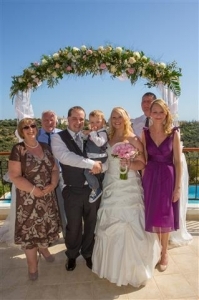 This is an ideal alternative for those that want to hire a villa for the duration of you’re wedding stay here in Paphos. Having your wedding ceremony and/or your wedding reception in a beautiful villa means that you will have privacy and choices with no time restraints governed by hotels and other venues. Our expertise lies in creating a unique and fully customized wedding at the villa of your choice and if you require we can personally help you find a suitable villa for the occasion. We have the right mix of energy, patience, creativity and knowledge to make your wedding everything your dreamed it would be. We have a wide selection of fabulous villas for you to choose from around the Paphos and Polis area. 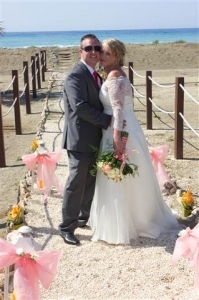 Toni & Michael married in a stunning Villa located right by the beach – Wonderful back-drop to a perfect Wedding!